The Beatles Song of the Day is Something. Something was written by George Harrison. Something was released as a single- the first A side that George Harrison had with The Beatles- and it was the second song on the first side of Abbey Road. As a single it peaked at #3. Frank Sinatra has called Something -the greatest love song ever written.Frank of course covered the song. 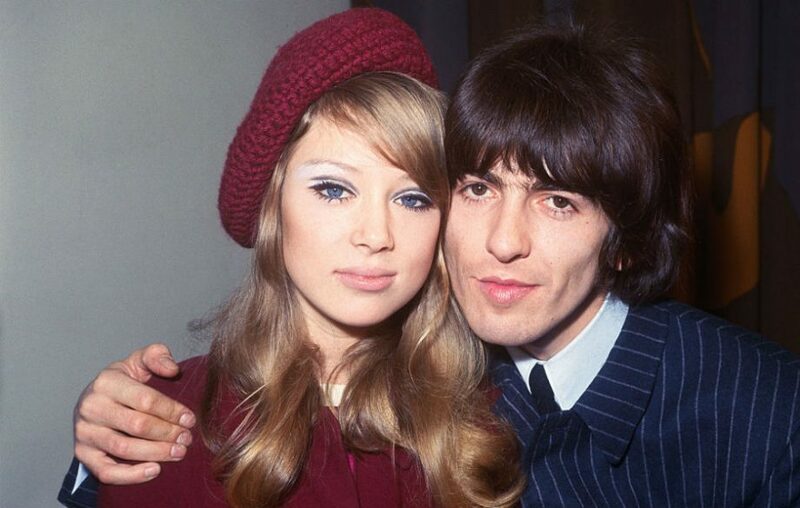 George was inspired to write Something- for his wife Pattie Boyd. Has any woman inspired such great songs as Pattie? A few years later she would be the muse for Eric Clapton’s blistering Layla. George had come into his own at this point with his songwriting- in my opinion the two best songs on Abbey Road are George Harrison compositions- Something and Here Comes The Sun. The line ‘Something in the way she moves” was the title of a James Taylor song- which Harrison took- absent-mindedly. John Lennon would say that Something was the best song on Abbey Road. It has been said that Something was issued as the a-side because Manager Allen Klein insisted it- The Beatles were losing money at Apple Records and Klein said they needed to bring in immediate cash. John also said with this being George’s first a-side- that he and Paul hadn’t been keeping him out previously-that their material had simply been better. That now was certainly no longer the case. Brilliant work! George Harrison: double-tracked vocal, lead guitar, handclaps: Paul McCartney: backing vocals, bass, handclaps: John Lennon: guitar: Ringo Starr: drums, handclaps: Billy Preston: organ: Uncredited: 12 violins, 4 violas, 4 cellos, 1 double-bass: Produced by George Martin. rating “Something” ***** out of 5 stars- a classic. recorded May 2, 5, July 16, August 15, 1969. Was released as a single along with Come Together- peaked at #3. Spignesi and Lewis ranked Something #28, Rolling Stone #6, critic Bill Wyman #13 out of 213 Beatles songs, The Beatles Channel listeners poll #8 and Jim Beviglia in his book #8. A very highly regarded song.